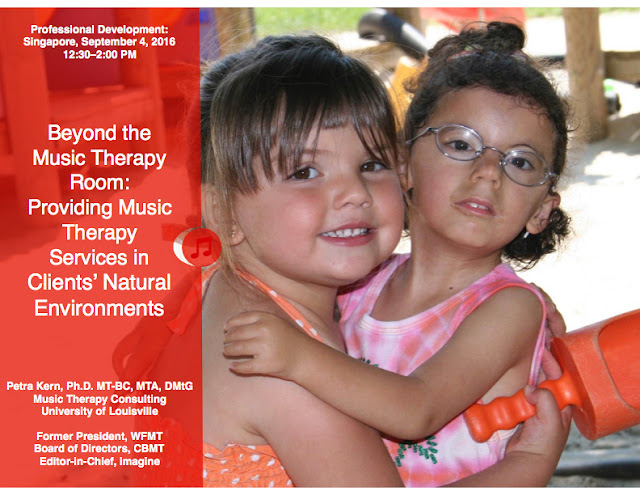 with our visiting experts - Sunday, September 4, 2016; 9 a.m. - 5:30 p.m.
A full day dedicated to the continuing education of professional music therapists. Please provide documentation of credentials by emailing sgmt.symposium@gmail.com. MT students and interns are welcome to register AFTER AUGUST 15 for 50% off for the day's proceedings. Students please send a .jpg of latest transcript or a letter from your professor or internship director to sgmt.symposium@gmail.com to express your interest. Seats will be allocated based on availability. Specially open to music therapists, MT students and MT Interns only. Sign up for PDD when you register for the Main Conference OR Pre/Post Training. Music therapists are highly trained in the art of music and therapy, but not always in the art of business. 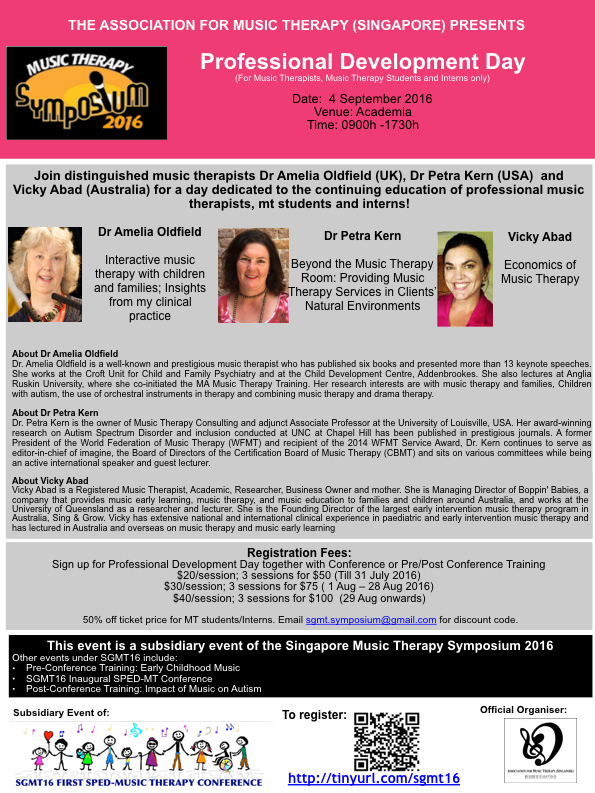 And yet in many countries, music therapy is not recognised as a health profession, or financial cut backs have resulted in funding cuts to music therapy positions. This combination has resulted in many people finding their own work, resulting in them setting up private practices and businesses. We believe that music therapists already possess a number of skills acquired through their training that are equally attributable to the business world. We call this process RAILE - resilience, attunement, improvisation, listening, and empathy. When these core therapeutic skills are transferred and applied within the business sphere their importance and value is seen and experienced. This workshop will explore the current economic climate that many music therapists find themselves working in, and explore how RAILE can be implemented to help them work effectively and profitably within an increasingly commercial and sales-driven society. Inclusion is based on the underlying assumption that a) the socio-cultural environment has a positive influence on children’s learning and development and b) children with special needs can participate actively in natural environments within their families, communities, and society when supported. Thus, federal legislation on inclusion mandates that children with and without disabilities play, develop, and learn together in various home and community settings. Yet, inclusion practice and research in music therapy is sparse. • supports of individuals and organizations providing inclusive services to children and their families. Participants will have the opportunity to reflect on the impact of inclusion for children with disabilities based on research synthesis points and their own experiences while learning about embedded service delivery models. Resources supporting inclusion of children with disabilities such as fact sheets, audiovisual sources, and e-courses will be shared. This presentation will be interactive and will use multimedia to illustrate the content. The author will begin by briefly outlining her background and how she came to train and work as a music therapist. She will then describe her specific approach in two distinct areas: music therapy with pre-school children with developmental difficulties and their families, and music therapy in child psychiatry with primary aged children (up to 12) and their families. The characteristics of her approach will be illustrated by DVD excerpts of her clinical practice with a wide range of different children and families. She will give examples of assessments which determine whether or not music therapy treatment might be effective, of how music therapy sessions have evolved and treatment goals have been achieved, of music therapy diagnostic assessments (MTDA) which help the multi-disciplinary team evaluate children’s strengths and difficulties, and of short term individual and family music therapy treatment. The presentation will end with excerpts of oral and written feedback from children and parents who have been involved in music therapy sessions with the author. Back to Conference website - Call for Papers until July 31st, 2016!